The folks manning Jurassic World never learned this valuable lesson, despite all that happened in the first three movies: Don’t. Play. God! Nevertheless, here we are, awaiting the big unveiling of the film’s next terrifying hybrid and genetically enhanced dinosaur. We’ve already seen glimpses of this big guy chasing after Chris Pratt in the Jurassic World trailer, and we got brief teases of its ginormous chompers from the film’s website. But here’s our best look yet…in toy form! 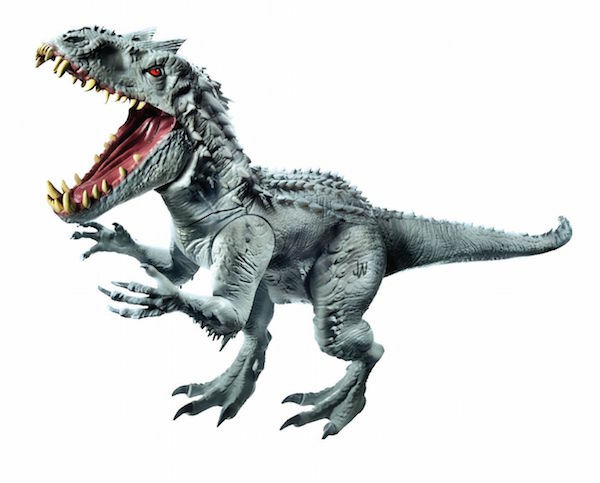 The Indominus Rex toy from Hasbro will be making its grand debut at the International Toy Fair in New York City this weekend, but a number of hi-res photos have dropped online a bit early. While Entertainment Weekly was the first to debut the toy for the new Jurassic World dinosaur, the folks at Super Hero Hype have compiled an extended photo gallery with a ton of pics. Indominus looks like the love child of a T-Rex and a velociraptor, which is a terrifying vision and probably not the best idea. Whoever thought it would be fun to take the advanced intelligence of these "clever girls" and the destructive strength of the king of the dinosaurs and put them together should be imprisoned for crimes against humanity. If the above image didn’t already send shivers down your spine, we know a great deal more about this killing machine. Standing at 40 feet, Indominus can move at 30 mph while confined to its cage, and it can easily climb up and out of its massive cage. As seen in the trailer, he can tear through vehicles like wrapping paper and its fast and smart enough to avoid detection. That’s why Pratt needs his army of raptors to hunt it down and detain it…if possible. Jurassic World takes place in a world where dinosaur zoos are commonplace. After all this time, the people running Isla Nublar (the original island in the first Jurassic Park movie) have apparently perfected the technique of caging these beasts. But now they need something bigger and with more teeth to attract more parkgoers, which is why their scientists have once again genetically tampered with DNA to create the most fearsome beast that’s ever walked the Earth. As expected, "sometimes when you cage the beast, the beast gets angry." This is one of the only good things come out of X-Men: The Last Stand, but Wolverine’s point definitely applies here. Jurassic World will debut the actual Indominus in theaters starting on June 12, and Pratt, Bryce Dallas Howard, Vincent D’Onofrio and those little boys running away in terror, Ty Simpkins and Nick Robinson, will have a lot on their plate.